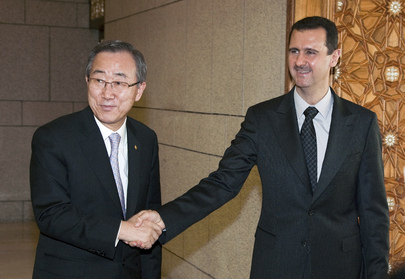 Ban Ki-moon's Syria Task Force Under Former Saleh Minister: UN Democracy Now? UNITED NATIONS, February 2 -- As the UN Security Council continued battling on Syria whether to "fully support" or merely "take into consideration" the Arab League plan, UN Secretary General Ban Ki-moon is setting up a UN system Task Force on Syria, meeting today, Inner City Press has learned. But, of concern to democracy advocates, Ban has selected as the chair of his Syria task force a person who served as a minister and ambassador for Ali Saleh, Yemen's dictator: Amat Al Alim Alsoswa. What is Ban saying, these whistleblowing critics asked Inner City Press, by put in charge of the UN's response to Syria a person who served another dictatorship and, they say, has even now been lobbying for the UN to not be involved in or monitor the promised democratization in Yemen? Serving as Amat Al Alim Alsoswa's deputy, the sources say, will be Oscar Fernandez Tarranco, now with the UN Department of Political Affairs but previously working with Amat Al Alim Alsoswa at the UN Development Program. On the same day, Yemenis and others scheduled a protest against Saleh's immunity in front of the Ritz Carlton -- and, incongruously, Lebanon's Mission tweeted a photo of the protest, here. "Retweets are not an endorsement, indeed," one wag said. But this wasn't a re-tweet: it was reporting. Watch this site. Footnote: At Thursday's UN noon briefing, Ban's spokesman Martin Nesirky began at 12:10 and then ended abruptly at 12:25, leaving even question that were in-queue not responded to. Even those that were allowed to be asked were not answered, including a request for an answer promised 10 days ago; not even an explanation for the lack of follow-through has been provided. We aim to have more on this.